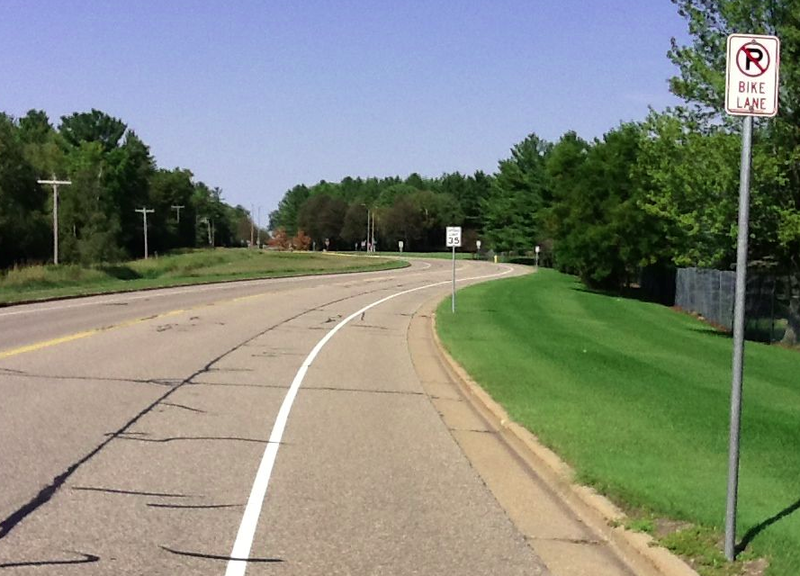 About a week ago, I saw that there were some new bike lanes marked in the roadways around Schmeeckle Reserve and SentryWorld Golf Course on the north side of Stevens Point. I’m pretty sure these bike lane markings are no more than three weeks old, since I rode in that area a few weeks ago without seeing them. Today, I took a closer look at these bike lanes. 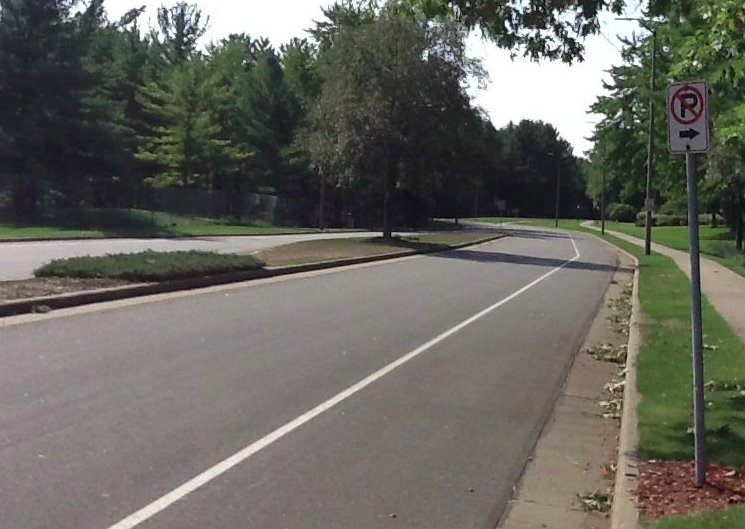 The new bike lanes are on Northpoint Dr and on Michigan Ave/N Reserve St. The bike lanes on Northpoint run from Michigan/Reserve to Wilshire Blvd, the stretch that separates Schmeeckle from SentryWorld. The bike lanes on Michigan/Reserve run from Maria Dr to the northernmost entrance to Sentry’s HQ, which is just past the entrance to SentryWorld. I had first noticed these “No Parking – Bike Lane” signs in the spring and had wondered about the absence of any bike lane road markings. Can one have a bike lane without the road markings which indicate the lane for bikes? I don’t know the answer to that, but I am relieved to see that what I noticed all summer was merely a partial implementation that is now complete. Experienced bicycle riders might wonder about the need for bike lanes on these particular roads, as they had been wide enough to allow motor vehicle traffic plenty of room to pass bicycles without having to cross the center line. However, road comfort varies significantly among people who bicycle. 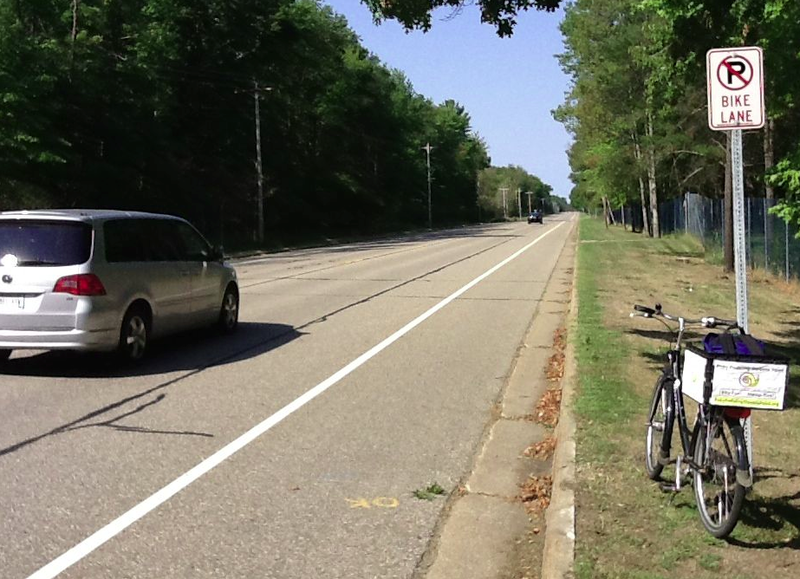 For the group of bicycle riders commonly labeled Interested But Concerned, a bike lane provides an additional measure of comfort due to providing a designated place to ride separate from where motor vehicles will travel. Statistically speaking, the Interested But Concerned crowd is over half the population. Many studies show that the best approach to making roads safer for all bicycle users, regardless of experience level, is simply to get more people out riding bicycles. So any infrastructure treatment that encourages more people from the Interested But Concerned group to ride is valuable. As much as I appreciate the new bike lane markings, I feel some improvements are still warranted. Bike lane stencil from N. 2nd St…How about putting some of these in the new bike lanes? 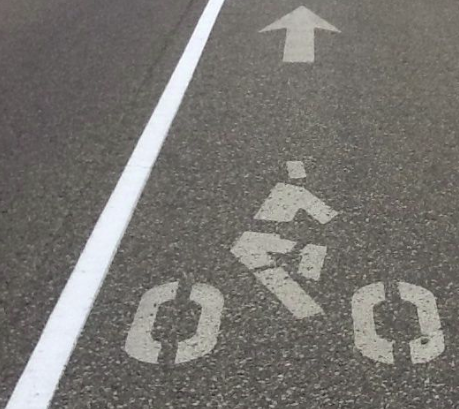 For starters, bike lanes in other cities (and even in other places in Stevens Point) have bicycle stencil markings in the bike lane to give additional visual clues to those driving motor vehicles that the edge lane is a bike lane and not a shoulder. No such bicycle stencil markings appear in these new bike lanes. I am hoping that the city has plans to paint such stencils and just hasn’t gotten around to that yet. Why is the phrase “Bike Lane” missing from some of the No Parking signs? Also, I saw some issues with existing signage. Although most of the signs indicate “No Parking – Bike Lane”, several are missing the “Bike Lane” designation and merely say “No Parking”. 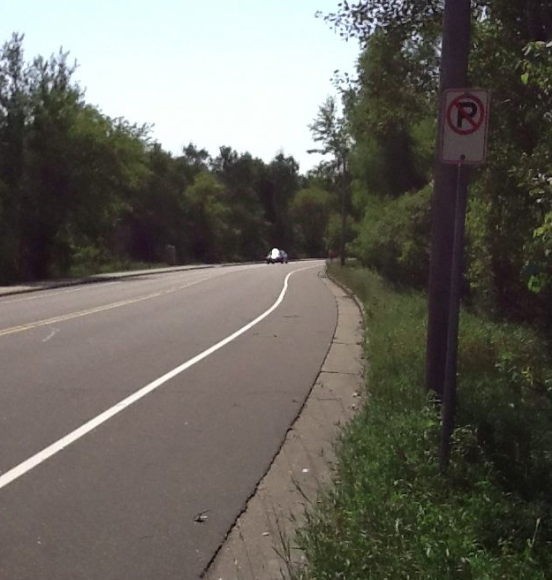 Consistency in these signs is desirable to reduce the likelihood someone in a motor vehicle might consider the sidepath to be a shoulder they might choose to veer into, potentially endangering someone riding in the bike lane. There was one sign – southbound on Reserve just across from the entrance to SentryWorld, that specified No Parking north of the sign (using a northward pointing arrow), which typically means that parking would be allowed to the south. Since these bike lanes are not wide enough to accommodate a bicycle and a parked car safely, it is apparent that this sign is improper and should be replaced by a No Parking – Bike Lane sign (with no arrows). Hmm…Which lane is for traveling straight? Finally, I found some confusing intersection markings where Michigan/Reserve crosses Northpoint. Approaching this intersection northbound on Michigan or southbound on Reserve, the bike lane temporarily ends and the full lane then becomes split in half by a solid white line. No arrows or other markings or signs indicate what travel paths are permitted from these two lanes. Without any markings, left turns should use the left lane and right turns should use the right lane, but it seems that traffic going straight through the intersection is permitted to use either lane. At a busy time, it seems too likely that cars will be sitting in both lanes, each intending to go straight through the intersection while only one standard traffic lane awaits on the far side. Perhaps one of these two lanes should be a turn only lane. It might be natural to direct straight traffic into the left lane and make the right lane a right-turn-only lane, but this would be awkward for bicycles going straight. At the end of the bike lane, they would have to veer left into the through lane, only to have to veer right on the other side to return to the bike lane. Making the left lane a left-turn-only lane also has safety issues for bicycle riders. Through motor vehicle traffic would veer right into the right lane where through bicycle traffic is heading – this creates much potential for car/bike collisions. Stevens Point traffic engineers probably need to examine this intersection and decide to add some marking and signage to heighten awareness of the collision potential – especially potential collisions involving bicycles – so that all road users act with more caution in this location. Despite these concerns, the new bike lanes are fantastic. 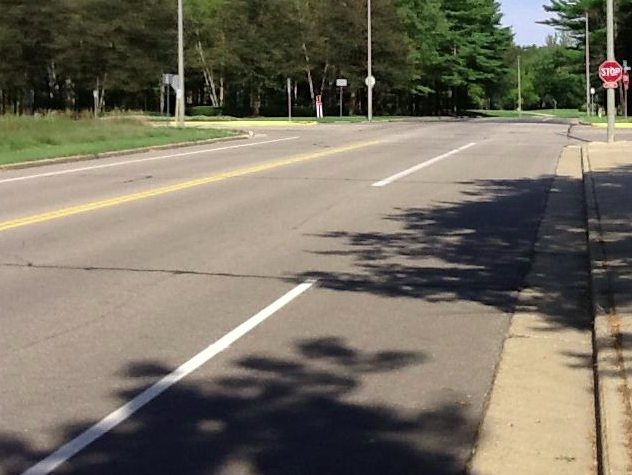 I applaud the city of Stevens Point for creating more quality bicycle infrastructure. This entry was posted in All Posts, Infrastructure, Stevens Point Area. Bookmark the permalink.